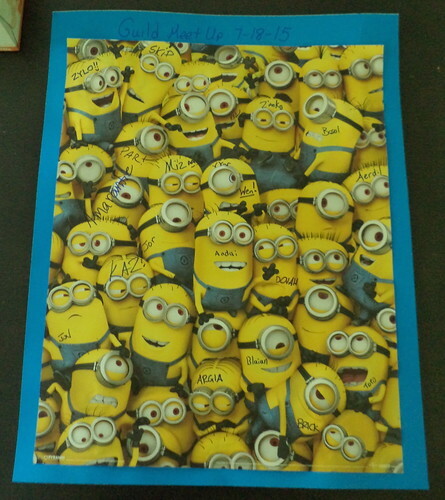 Remember the minion poster I had all my guild members sign who attended the meet-up last month? I finally framed it and put it on the wall. First step was deciding exactly where I wanted it. I have a poster from the "Who Framed Mr. Burns" The Simpsons' episode. It was in TV Guide, back when that was still an extremely popular magazine. A friend kept the poster and gave it to me. It hangs in the hallway in the house above a plaque reading, "Do not meddle in the affairs of dragons for you are crunchy and good with ketchup." 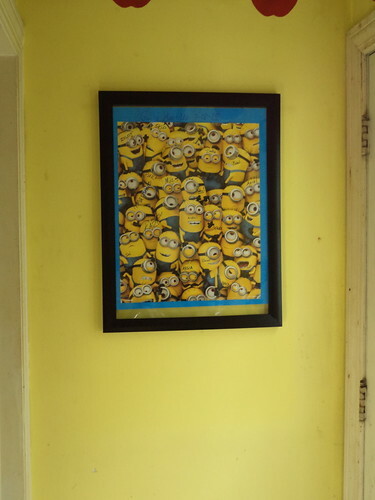 I had considered moving The Simpsons poster to a different wall and putting the minion one in its place. But this is bigger than The Simpsons one and would require a readjustment of the plaque and new holes and an eventual repainting and I didn't want to mess with that. Then, as I was leaving for work one day, I remembered how I wanted to repaint the back entry. My kitchen has been yellow since Carole was little. The apples were added a year after the kitchen was painted. I thought one of my goals would be to repaint this space a lighter, brighter yellow, a more Minion yellow. The door frame and the back of the back door would be painted yellow. The ceiling would be painted yellow and I'd paint over the apples and put strategic minions around the space. 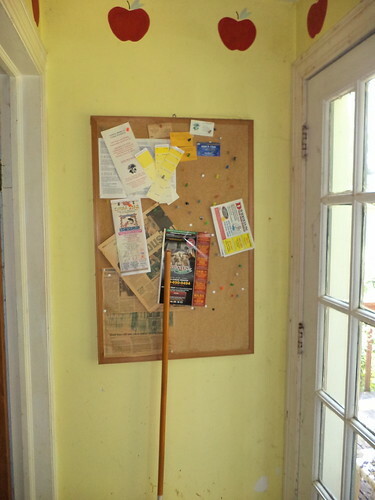 And the old, very old, cork board, which is really just a catch all for paper junk, would go. Tell me that's inviting. I double-dip dare you. It just looks junky and I never use anything stored on the board. Time to give it away. So Pam and I found a frame at JoAnn Fabric that I felt would work. It more than worked. Look at the space now. What a difference a piece of art makes. I almost don't need to repaint the walls as the color complements the poster. I still think I'd like a coat of a lighter yellow just because it would give the space a fresh feeling to it. But there is not the feeling that painting HAS to be done now, you know. I can still paint through October and leave the door open so the space can breathe, if I get better and have my energy back. The cork board went to a local Veteran's group that takes donations. Someone will be happy with it. Now, whenever I leave the house via the back door, I smile. I will stop and read the names of guild members on the poster. It makes me happy and that's what spaces in your house should do, make you happy.